Sarah Spain of espnW sits down with the Chaplain of Loyola University Chicago Sister Jean Dolores Schmidt to talk about her passion for Loyola-Chicago sports. Picture this: A 97-year-old woman, maybe 5 feet tall, is part of a huddle with Division I men's basketball players. She's wearing a Loyola University Chicago sweatshirt and a maroon-and-gold scarf. Her Nikes are also the school colors, and if you look closely, you'll notice "SISTER" is stitched into the left heel and "JEAN" on the right. "Good and gracious God," she says, the start of all her pregame prayers. The players bow their heads, some close their eyes. Their arms naturally reach around each other's shoulders. Sister Jean settles for the hips. She tells them to watch out for Nos. 3, 5, 13, 23 and 24 on the other team. "Don't let the refs get under your skin," she continues. "Hold those hands up so they don't think you made a foul. If somebody flops on the floor, just ignore them." There are smiles among the players as she sends them onto the court: "Good and gracious God ... let's get a big 'W' after our name." Sister Jean Dolores Schmidt is the chaplain for the men's basketball team at Loyola, a Jesuit school along Lake Michigan on the North Side of Chicago. 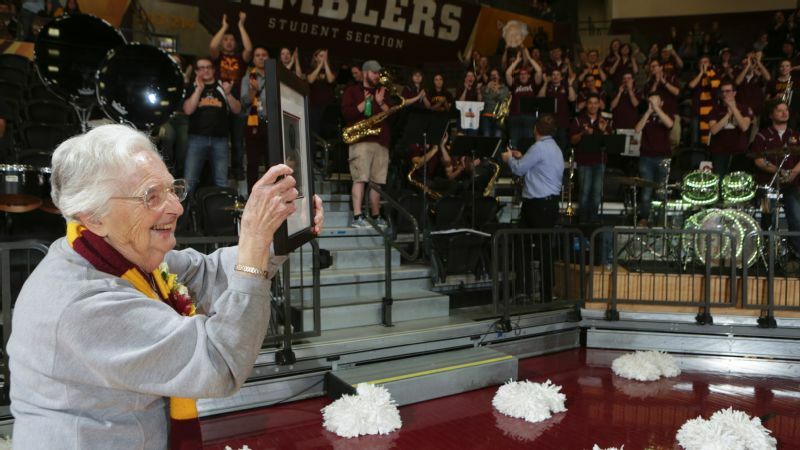 Sister Jean, as she's known, is the team's most loyal fan and a campus celebrity. She's attended all but maybe two home games since becoming the chaplain in 1994, after she retired from teaching in the school's education department. 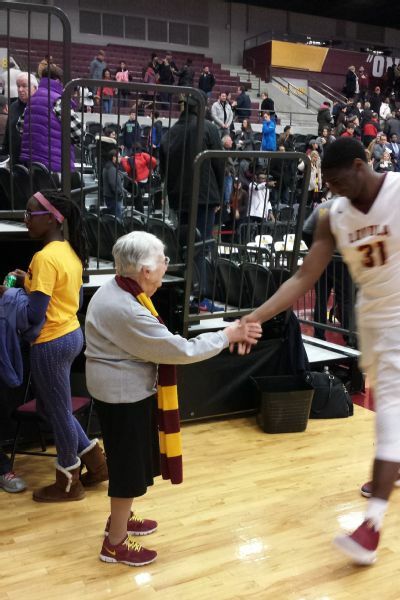 Sister Jean can't walk more than 10 feet in Gentile Arena without someone saying "hello." Recently, fans and administrators have been offering congratulations on her induction into the Loyola Athletics Hall of Fame last month. She'd been awarded a plaque at halftime of a game, and she quickly showed it off to an eager section of students. "I felt like an Olympian running around the track with the American flag," she says with a laugh. "I felt like an Olympian running around the track with the American flag," Sister Jean says of showing off her Loyola Athletics Hall of Fame plaque to students at a basketball game. 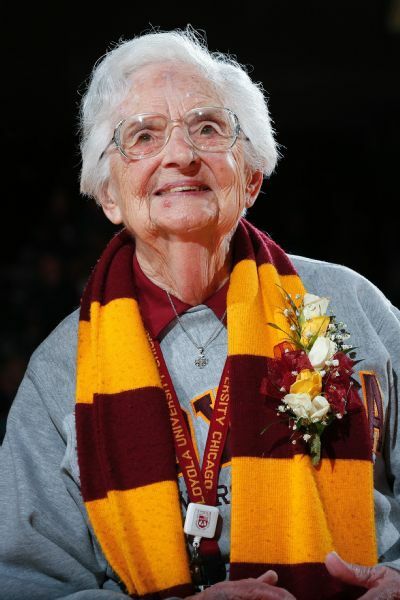 Sports have always been a part of Sister Jean's life. She was born in 1919 and played basketball at her San Francisco high school in the 1930s. Back then, the court was divided into three sections for women, with no player being allowed to traverse the whole court, and only certain ones could shoot. "The game was so slow," Sister Jean said. After becoming a nun at a Sisters of Charity of the Blessed Virgin Mary convent in Iowa, Sister Jean returned to California in 1941 to teach elementary school. She also volunteered to coach at Los Angeles-area schools, which hadn't previously offered sports teams -- so she started them. She coached girls' basketball, volleyball, softball and even pingpong and yo-yo. 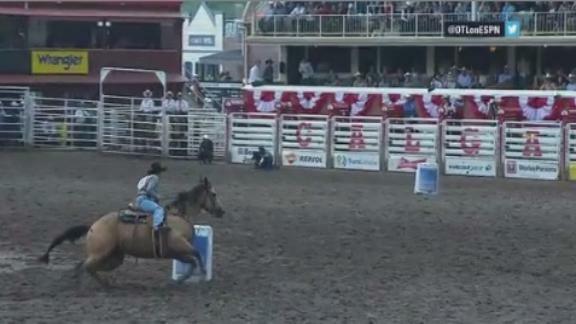 To "toughen" the girls, she had them play against the boys. The North Hollywood school where she taught was not far from Universal Studios, and Sister Jean's students would sometimes appear as extras in movies and television shows. "They had trailers for kids to study and do their work while they were there," she said. Sister Jean taught two of Bob Hope's kids, and the children of Frank Sinatra and John Wayne also went to the school. Sister Jean took a teaching job in 1961 at an all-women's Catholic school, Mundelein College, which neighbored Loyola. While preparing young women to teach in Chicago's public and Catholic schools, she attended athletic events at both Mundelein and Loyola. She remembers when Loyola won the 1963 men's basketball national championship over Cincinnati in an overtime buzzer-beater. "That night, another nun and I watched it on a TV about this big," she says, her hands indicating a TV the size of a toaster. "It was a [tape] delay thing. Of course, we didn't have cell phones, so nobody told us we won the game. All the fellas from [Loyola] came to our residence hall at Mundelein and got all the gals, and they walked down the white line on Sheridan Road saying, 'We won! We won!' That was at midnight. Everybody was so excited." Her Loyola pride compels her to add: "We're the only ones, still, in Illinois that have won the NCAA championship." 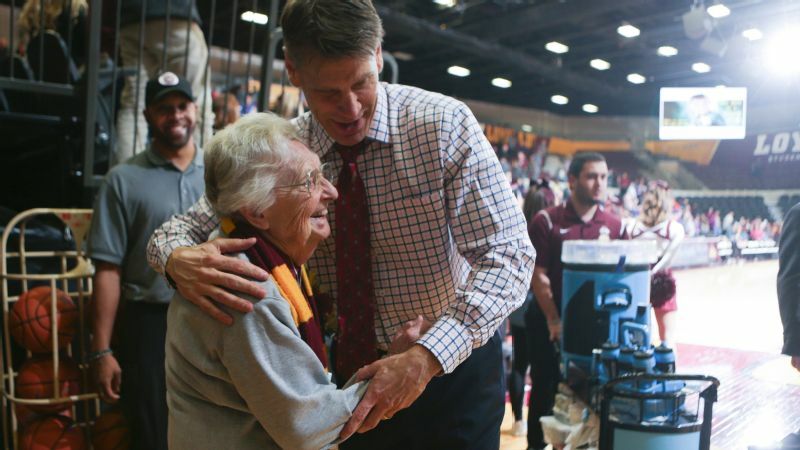 Sister Jean can't walk more than 10 feet in Gentile Arena without someone saying hello. Mundelein merged with Loyola in 1991, and she was named the team's chaplain in 1994, beginning her near-perfect game-attendance streak. 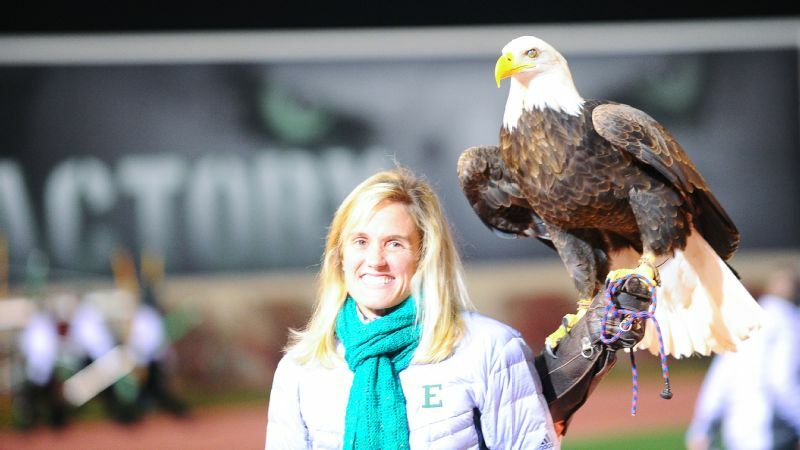 "She's just not just an iconic figure who we parade around and put in front of folks," says Loyola athletic director Steve Watson. "She works longer hours than anybody." Sister Jean is also the chaplain of her dorm, where she lives among 400 of Loyola's 11,000 undergrads. Her office is in the middle of the school's student center. "I leave my door open all the time," she says, "regardless of how loud the music gets or how loud their voices get, so they can feel free to come in." There is no shortage of visitors. Students stop by asking for relationship advice or simply seeking a break from a stressful day. While Sister Jean is most closely associated with the men's basketball team, she attends games for women's basketball, too, as well as those of the volleyball and soccer teams. She does not typically attend road games. "They'd be worried about me," she says. "I tell them, 'Just get the ball into the basket. That's the important thing.'" Instead, she watches on TV or via live stream on her computer (or listens on the radio, if necessary). When there are weeknight home games, she'll often leave her dorm in the morning and not return until after 10 at night. She owns a cell phone but doesn't text. "People expect a response right away," she says. "I've got things to do." "They always say in life to have a purpose," says Porter Moser, head coach of the men's team. "She has a purpose on this campus. She has a purpose with our basketball team and our athletic program." People light up when they see Sister Jean. She connects with people on a personal level, even those she is meeting for the first time. Maurice Kirby, a Ramblers forward in his second year at the school, says, "When I see her on campus, she'll give me a hug and ask me how my day is going." And, of course, Sister Jean "always brings up the game we're about to play." After all, basketball is Sister Jean's passion. On Moser's first day at Loyola in 2011, he found a folder on his desk. Inside was a detailed evaluation of every player on the roster and what they needed to work on over the summer. It was from Sister Jean. Porter Moser, head coach of the Loyola men's basketball team, right, says he received a detailed evaluation of every player on the roster from Sister Jean when he arrived in 2011. 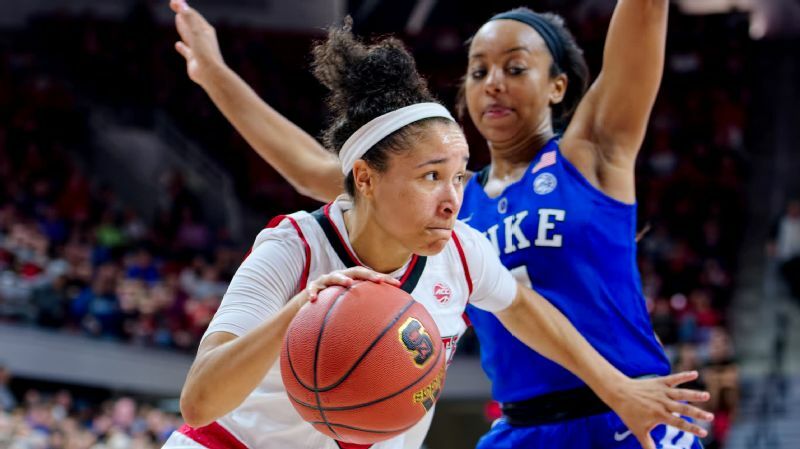 The details of her pregame talk to the team, which is equal parts prayer, scouting report and motivational speech, are gathered from researching the opponent's statistics online. One time, she was near the scorer's table as the opposing coach approached to submit his starting lineup. "Oh, do you want me to do your lineup for you?" Sister Jean asked. The coach agreed. She provided four of the players' numbers -- a lineup that matched what the coach had planned -- turned back to him and said, "The fifth one's on you." The entire crowd gets a taste of Sister Jean just before the start of home games. She stands on the court with a microphone and reads her pregame prayer. At a recent game against Bradley University of Peoria, Illinois, she welcomes the opponent -- "a very young but powerful team" in the Missouri Valley Conference -- and asks "that both teams play with respect toward each other and strive to put into practice what they have learned from their coaches." She continues, her Loyola loyalty kicking in: "We Ramblers are asking you, our God, to give us a good start, to earn points early in the game, so that we can slow the pace as the game clock ticks away. We ask also that the numbers at the sound of the final buzzer indicate a big 'W' for the Ramblers." Sister Jean prays that there are no injuries and blesses the fans, cheerleaders and bands. Lastly, "please help the referees to call the game with precision for each team. Amen. And Go Ramblers." The crowd erupts with applause, an atypical response to a benediction -- except when delivered by Sister Jean. Sister Jean's pregame prayer typically receives an eruption of applause from the crowd. Once the game starts, Sister Jean locks in from her seat five rows behind the Loyola bench. She could sit wherever she desires, but she doesn't want to be too close to the action after stray balls left her with a broken wrist at a soccer game and a black eye at a volleyball match. From afar, Sister Jean doesn't seem too animated, clapping softly now and then. Sit next to her, and you'll discover she's as passionate and knowledgeable -- although a bit quieter -- as any die-hard fan. "Ohhh!" she says, mixing excitement with a touch of surprise and rising out of her seat just a bit anytime Loyola makes a big play. She shares facts on the players (Nos. 13 and 14 were grade-school teammates), the opponent ("Their free throw percentage is 67 for the season") and even the sponsors (Insomnia Cookies delivers until 3 a.m.). She doesn't miss a thing. When a player's second-half absence is questioned, Sister Jean notes he had motioned to his bench for a timeout earlier and was probably hobbled. She smiles at the band members, who bop around as they play, one of them holding a giant cutout of her face. God must have had more important things to deal with this night, because it doesn't seem the refs are calling the game with "precision." There are a lot of ticky-tack fouls that halt the flow of the game in the second half. Sister Jean points out a missed traveling violation. It doesn't stop the Ramblers from going on a run. Despite a 15-point margin over their opponent, "the lead is not safe," according to Sister Jean. "Get rid of it, Milton," she implores during an out-of-bounds play, fearing a 5-second call against senior guard Milton Doyle. Asked for her favorite part of the game of basketball, she says, "I like when they each make a couple of baskets so their confidence is up. Otherwise they get deflated." On this evening, six Ramblers score (including three players off the bench), led by Donte Ingram's 24 points. Moser empties his bench for the final minutes, and Loyola gets the "W." Sister Jean congratulates the players as they leave the court. A school employee will give Sister Jean a ride back to her dorm. As she does after every game, she'll email Moser before bed. "It's good to know you've got someone in your corner, win or lose," Moser says. The next morning, Sister Jean will individually message each player on the roster. The body of the email is the same for everyone -- an assessment of the team's performance, noting any major lapses -- with additional player-specific comments. "Donte, those 3s were perfect because they sliced through the basket," she might write. Little-used reserve players are thanked for their support: "You were only out there for a minute, but I could tell you gave it your all." She might encourage a player to stay out of foul trouble or make his free throws, but the tone is overwhelmingly positive. "It lifts our spirits after a tough loss," Kirby says. Since Loyola absorbed Mundelein, the Ramblers have had five head coaches and just five winning seasons, never reaching the NCAA tournament. This year, though, thanks to a dynamic offense, Loyola is 17-11 (ranked fourth in the Missouri Valley). When asked about the significance of a hypothetical NCAA tournament appearance, Sister Jean lights up, eager to answer. "That would be fabulous. If we did [make it], we'd probably have to take it one step at a time, since they've never put their foot on an NCAA [tournament] floor." She acknowledges that Wichita State and Illinois State are the top teams in the conference this year, and that any postseason invitation would benefit the program. Sister Jean is always thinking about the team and the school. You won't find a bigger advocate of Loyola and its student-athletes, and her dedication is appreciated and recognized by the campus community. Her custom sneakers were a gift from the basketball team several years ago, and the athletic department made a Sister Jean bobblehead. Beyond those tangible items -- and even larger gestures such as the Hall of Fame induction -- is a genuine love. Like Sister Jean's commitment and impact, it's immeasurable.